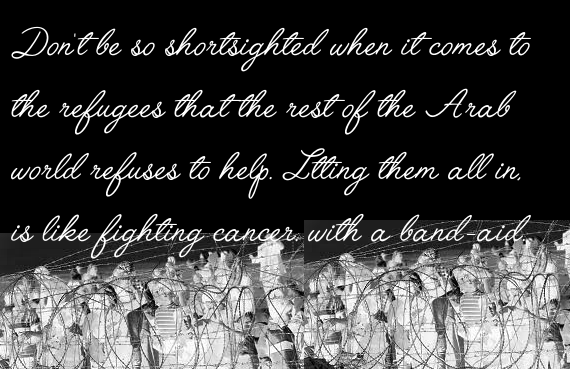 I am more than surprised at the incredibly short sighted response to the Syrian exodus. Some posts that I saw on Facebook really made me think of why the rest of the Arab world is not doing more to help. Saudi Arabia has the easy capacity, to take in hundreds of thousands at least. I know that there are historical and bloodied differences between the two branches of Islam, but for me it shows the absolute heartlessness of the Wahabi form of Islam favoured by the Saudi Arabians and their material excesses. Conditional money and assistance! The Gulf between those who can casually squander so much money on ornate mosques, while whole families and children die on flimsy dingies, while trying to make their escape is horrific. The majority of those fleeing maybe Shia Muslims, but aged disputes are hardly a valid reason for inaction. Whenever I see these poor rabble rousing Muslims on the streets of wherever shouting “Allahu Akbar”, I roll my eyes in disgust. Can’t they see their cult, with its core of ideological arrogance and hatred, for what it is? Their god to whom they give everlasting praise and a swift sword/bullet to anyone who dares to offend him, or dares to challenge their beliefs. Of course people are nervous about the ramifications of letting these people, and their obnoxious brain washed beliefs in. Are we meant to take in whole populations of these countries, to the detriment of our own hard pressed citizens? For me, its about learning the lesson of other close countries and being an aware realist. 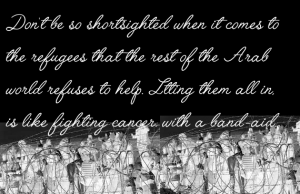 Is foreign aid, and a concerted effort to topple the Asad regime not enough?. Short term problems quickly transform themselves into long term issues, with often irreversible difficulties. In Germany school children close to reception centres for refugees have been asked to wear full sleeved tops, during P.E. so as not to offend their new neighbour’s beliefs. Shame on the authorities for acquiescing. 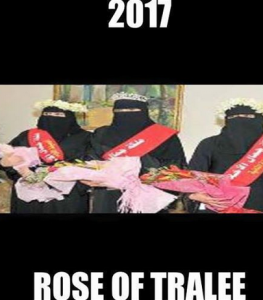 Should they not be more concerned about their children suffering from vitamin D deficiency, or even with sweaty skin from covering up in order to appease. 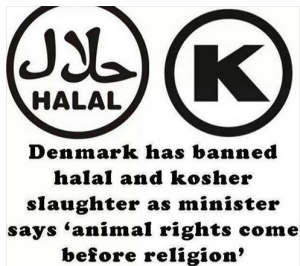 Recently refugees refused to eat meat that was not halal. 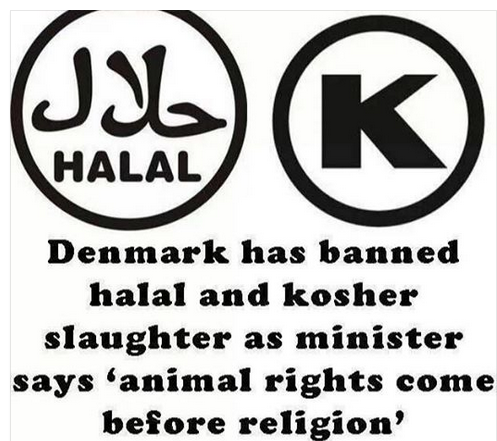 I am glad .that animal cruelty is more important than religion, at least in Denmark’s lone case. How an animal hung upside down, with its throat slit, and slowly dying making the meat so spiritually significant, is far beyond any dictated ramblings. The fact that they have already have their minds messed up by living through barbaric dictators is almost secondary to the mental poison which they are bringing underneath their veiled women and their Mecca facing prostrations. Hopefully the little boy who died on the beach, is not going to be abused or misused in his lonely death,as a cushioned battering ram, to knock the doors down. I certainly do not want to use Syrians as a scape goat, to say that the time and resources used on them could be better spent making life some what easier for a section of Irish society, that has been for too long either ignored or partially dismissed. How dare they want to struggle out of their beds, and live some kind of life. The cheek of them! As cruel as it can sound, I reluctantly understand what people mean by, “looking after our own. first”. My full and absolute thoughts and feelings are with those people with disabilities who have picketed outside Dial Eirann for over 56 hours. This campaign was largely overshadowed by the media attention soaked up by the Syrian refugees, alongside a very rehearsed act to look good in other international eyes. What about the other neglected generations, of those who are seldom seen and just trying to have their issues heard. I am no gushing fan of the disability sector, which can be as mean and cut throat as any other business enterprise. Maybe, they are being indirectly told to manage their existing resources better? For the past few years, I have descended into the lowest rungs of the disability sector, and witnessed at first hand the hardships and steely toughness it takes to get through the days.